VIDEO: 'Aswang' roams in Batangas? 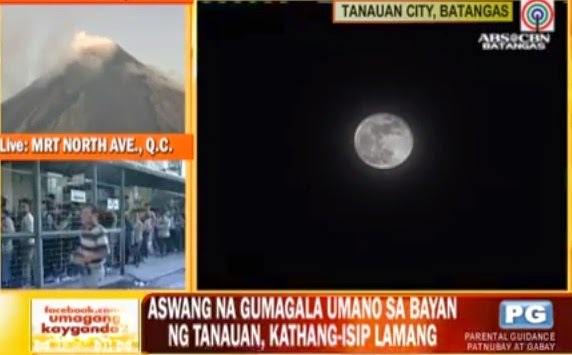 BATANGAS, Philippines - A ghoulish vampire-like werewolf ghoul known as 'aswang' in Filipino folklore is allegedly roaming in Batangas recently, netizens have posted in TV Patrol Southern Tagalog Facebook page. According to some netizens, the message came from the Tanauan police station. It warns them not to go out in the streets at night because allegedly, a group of 'aswang' riding in a truck roams the province. In another post, citizens of Tayabas, Quezon was warned to avoid a big woman with glaring eyes. But the Tanauan City police has claimed that these stories are just hoax and said that there's no such notice that was disseminated as it will bring fear to the public. "Wla pong katotohanana yan sapagkat wala pa po kami report na natatanggap sa 48 barangay dito na sila po ay may nakitang aswang sa kanilang barangay," Police Inspector Dante Majadas of Tanauan City PNP said to ABS-CBN News. Residents were also convinced that these stories are just fabricated. The myth of the 'aswang' is well known throughout the Philippines, except in the Ilocos region, which is the only region that does not have an equivalent myth. It is especially popular in the Western Visayan regions such as Capiz, Iloilo, Negros, Bohol, Masbate, Aklan, Antique and Siquijor. Other regional names for the aswang include "tik-tik", "wak-wak" and "sok-sok"